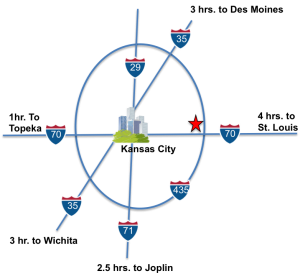 Kansas City Cold Storage is centrally located in the heart of the Midwest with easy access to all major highways providing frozen, cooler and dry food distribution. We receive and dispatch hundreds of tons of perishable products each day. Goods in cooler, freezer and dry storage occupy millions of cubic feet of space. You couldn’t personally select a better frozen food distributor. Kansas City Cold Storage operates its own truck line with many types of refrigerated trucks available to ship anywhere within the Midwest. Our refrigerated fleet covers the entire Midwest under interstate authority. Regional consolidation and redelivery for all Major Grocery Warehouses and Distribution Centers. Including but not limited to Associated Wholesale Grocers-Kansas City, Walmart Distribution Centers-Moberly, Ottawa and Harrisonville, Sysco-Olathe, Aldi-Olathe, Target-Lawrence, U.S. Foods-Topeka and many others. We have designed our shipping facilities to meet the needs of the mass supplier. Indeed, our in-out service is much faster than most storage facilities – a turn-around time of as little as three hours as compared to the industry average of 8 hours. Contact us and we’ll tell you more about how we should be your frozen food distributor.